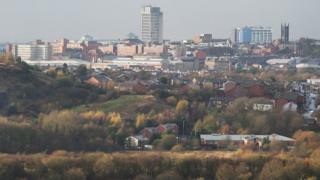 Oldham in Greater Manchester is the most deprived town in England, an official study into housing and poverty has found. The Office for National Statistics found it contained the highest proportion of deprived areas, followed by West Bromwich in the West Midlands. Guildford in Surrey was the least deprived town. The study considered factors such as income, employment, health, education, skills and training and crime. It also looked at disability, access to housing and the built environment in cities and towns in England and Wales. The north-west of England had five of the ten most deprived towns and cities, while the West Midlands had three of the top five. The data revealed that while Oldham was the most deprived overall, West Bromwich came off the worst for employment and income. The town in Sandwell was ranked the lowest out of 109 areas for both aspects and second lowest for education. Where are the most and least happy places in England? Birmingham was also given the lowest ranking for housing. At the opposite end of the table, Guildford, Woking and St Albans were all found to have the highest proportion of the least deprived areas. The study by the ONS also revealed 29 out of 45 towns and cities in southern England had an average house price of more than £200,000, compared with only three out of 64 in the North and Midlands. Through research looking at England and Wales, the ONS found house prices have risen the most in Cambridge since 2010, increasing 47%. Swansea saw prices decrease 4% over the same period. The cheapest place to buy a home is Burnley in Lancashire, according to the ONS. A detached home goes for an average of £166,000 while a semi-detached attracts about £120,000. Flats go for an average of £69,950 while terraced houses are priced at an average of £54,498, making the overall average £78,000. St Albans has the most expensive housing, with an average detached home costing £675,000 or £529,400 for a semi-detached. An average terraced house goes for £400,000 and a flat for £255,000, making the overall average £390,000. Councillor Eddie Moores, Oldham Council's cabinet member for health, said: "In the last five years we've worked hard to improve health, wages, skills and employment opportunities through initiatives like Get Oldham Working, the Oldham Education and Skills Commission and the award-winning Warm Homes Oldham, which has already lifted more than 3,300 people out of fuel poverty. "We've also invested in the borough's biggest post war regeneration programme so that people can benefit from a growing economy and get more opportunities to succeed." Sandwell Council Leader Darren Cooper said: "We have faced massive cuts from central government, and this has taken a huge amount of money out of the local economy. "Some of the ONS indicators are out of the council's control, but we are trying hard to build the local economy and create more jobs, fighting back against the rising tide of austerity." Among the successes were the New Square shopping centre, campuses at Sandwell Colleges Central and Sixth Form Campuses, and the Health Futures University Technical College and there were plans for an expanded Metro and improved bus and road networks, Mr Cooper said.